Dylan Riley Snyder Photos, News, and Videos | Just Jared Jr.
How cute are Allisyn Ashley Arm and her fiance, Dylan Riley Snyder?! The newly engaged couple rocked matching faux snakeskin looks for the premiere of Someone Great held at ArcLight Cinemas on Wednesday night (April 17) in Hollywood. We have to file this under couple goals. Just a few nights before, Allisyn and Dylan were seen out at the The Curse Of La Llorona. If you didn’t know, Allisyn stars in NBC’s A.P. Bio, and there’s an all-new episode tonight, so be sure to tune in! Katherine McNamara looks stunning in a little black dress at the premiere of The Curse Of La Llorona held at the Egyptian Theatre on Monday night (April 15) in Hollywood. The 23-year-old actress had a mini-Shadowhunters reunion with co-stars Alberto Rosende, Tessa Mossey and Isaiah Mustafa. 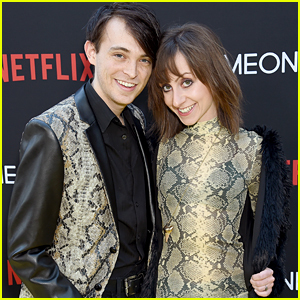 Newly engaged couple Allisyn Ashley Arm and Dylan Riley Snyder and Jake T. Austin were also seen on the black carpet with young stars of the movie, Jayden Valdivia, Jaynee Lynne Kinchen, and Roman Christou. The Curse Of La Llorona is out in theaters on Friday, April 19th. 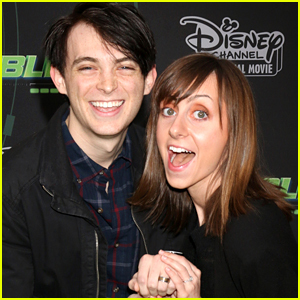 Allisyn Ashley Arm and Dylan Riley Snyder are adding more fuel to marriage rumors by showing off the rings at the premiere of Kim Possible held at The Television Academy on Tuesday night (February 12) in Los Angeles. The longtime couple just announced their engagement at the top of the year to fans on social media – but did they get married yet? We’ll have to find out, so stay tuned! Dylan and Allisyn were joined at the star-studded premiere by Bizaardvark stars Madison Hu, Ethan Wacker, a red-headed DeVore Ledridge and singer Carson Lueders. Sending all the congratulations in the world to Dylan Riley Snyder and Allisyn Ashley Arm! The two former Disney stars – he starred on Kickin’ It, and she starred on Sonny With A Chance and So Random! – got engaged over the holidays! Joey King keeps it cute in a bright green top while attending the Eighth Grade premiere held at Le Conte Middle School on Wednesday night (July 11) in Los Angeles. The 18-year-old Kissing Booth star joined stars Emily Robinson, Elsie Fisher, Daniel Zolghadri, Jake Ryan and director Bo Burnham at the event. The film centers on Kayla (Fisher), who tries to survive the last week of her disastrous eighth-grade year before leaving to start high school. Calum Worthy, Madison Beer, Luke Benward, Carter Jenkins, Olivia Sanabia and couples Italia Ricci and Robbie Amell, and Dylan Riley Snyder and Allisyn Ashley Arm were also spotted at the screening event. Joey gave her stamp of approval to the film, too. Check out her tweet below! FYI: Emily is wearing Giambattista Valli. Olivia wore a TopShop dress.